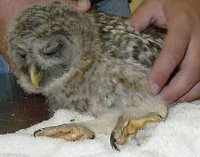 Late Thursday afternoon, a lady brought in a downy Barred Owl she had found on the ground in Dover. With his eyelids bruised and him unable to stand, I determined we did need to intake him. We'll provide him with medical care to stabilize and hopefully get him back out to the nest quickly. Dr. Davis evaluated him on Friday and believes there are no fractures yet there is plenty of bruising. He administered some steroids and antibiotics. With a couple days of TLC we hope the little one will be standing and alert in just a couple of days so we can get him back with his parents.